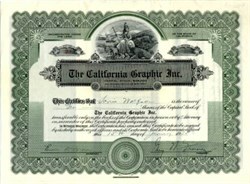 Beautifully engraved certificate from the California Graphic Inc. issued in 1925. 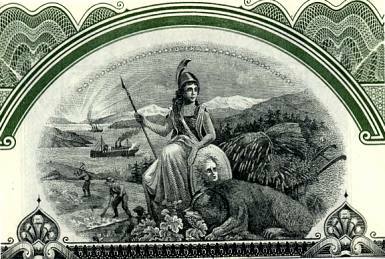 This historic document was printed by W.R. Jeffries Co. and has an ornate border around it with a vignette of the California State Seal. This item is hand signed by the Company's President ( Guy W. Finney ) and Secretary and is over 92 years old. The certificate was issued to Sonia Wolfson and signed by her on the back. Sonia Wolfson wrote "Art and Artists," which was published by California Graphic, on 16 April 1927, p. 6. Sonia Wolfson was a publicist with 20th Century Fox for 35 years. She was born in Gomel, Russia. Wolfson joined Fox in the early 1930s after working as an associate at the Stendahl Art Gallery and as a freelance art critic in Los Angeles. After being fired by Fox during the fallout surrounding the failure of "Cleopatra," she worked briefly at the Frank Perrett publicity office, and joined Anne Strauss, Esmee Chandlee and Emily Torchia on the MGM publicity staff. Wolfson was later rehired by Fox. During her career, she wrote some of her famous lengthy star bios for such films as "South Pacific" and "Island in the Sun."